This summer, we’re serving up a variety of seasonal craft beers at The OFFICE Tavern Grill. 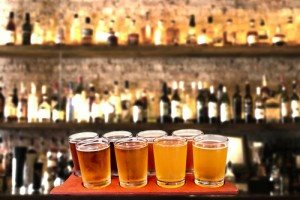 You’ve probably heard of craft beer, but what does the term really mean? Craft beers are produced by small breweries—ones that distribute fewer than 6 million barrels of beer each year. And most of the beers have flavors that come from innovative ingredients or brewing processes. Here’s the lowdown on what’s on tap this summer. Several of these beers come from local breweries. Summer Love Ale, Victory Brewing Company: This light-bodied golden ale has a refreshing lemon taste. It pairs nicely with pizza, chicken and salads. Hell or High Watermelon, 21st Amendment Brewery: With this straw-colored beer, the flavor is pure watermelon. It’s brewed as an American wheat beer, then undergoes another fermentation using fresh watermelon. Monkey Chased the Weasel, Carton Brewing: This sour ale is infused with mulberry fruit, which comes from a tree in the backyard of the Atlantic Highlands, NJ-based brewery. Farmhouse Summer Ale, Flying Fish Brewing Co.: This light beer has an earthy, spicy flavor with a rich, creamy head. It’s the perfect accompaniment to spicy foods, fish, salads and grilled dishes. It makes a great marinade too! Jersey Summer Breakfast Ale, Cricket Hill Brewery: With this beer, the flavor is tangy fruit and cloves. It’s a great match for bacon and eggs, as well as a backyard barbecue.